There is a time for Peace, a time for War, and a time for Celebration. 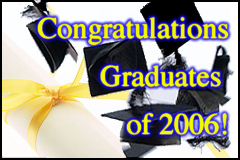 June is a time for Graduates and their Families to rejoice! Some folks feel that anytime is a good time to protest the war... I disagree! Every purpose has a time, but at all times Peace requires respect.